Developer - Military Simulations Inc. 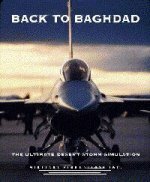 Comments - Back to Baghdadwas an F-16 simulation set in the Gulf War (1991) . It was a DOS sim with claims to high fidelity of flight model and weapons systems modelling and was priced about 30% higher than other PC sims at the time. The publishers Military Simulations Inc. went on to specialise in military sims and released no more products for the home market. It was unique in that it supported a second monitor for the radar display - and this while running in DOS ! Fritz Gunter of Atrox Graphics has created a graphics upgrade for Back to Baghdad which improves the framerate and the look of the clouds, terrain and aircraft.